Since the Senate failed last week to pass a "skinny" repeal bill, Senate GOP leadership has sent a clear message it is moving on to tax reform and bipartisan talks for a short-term Obamacare market stabilization bill. But some Republicans are not giving up on the years-long promise of repeal despite questions over whether the GOP conference can reach a consensus. Will McConnell Produce On Promise To Lower Health Care Costs? There is a reason Big Pharma stocks, insurance stocks, and hospital stocks have gone up over the last two weeks. Because very little is changing when it comes to bringing down the cost of health care in this legislation. Trump told Senate Majority Leader Mitch McConnell (R-Ky.), who led the meeting at the National Republican Senatorial Committee headquarters, that he’s “not feeling the love” from the leader, according to a lawmaker who attended. Trump made the comment in a joking tone, but he also sent a clear message that he wants more support from the people who are supposed to be his allies on Capitol Hill. The two top Republicans in Congress are pursuing strikingly different strategies on spending bills this year, setting up a possible collision when funding for the government is scheduled to expire just weeks before the presidential election. Mitch McConnell said that he does not see any way the Dem.-controlled Senate and GOP-led House will agree on immigration reform legislation this year. McConnell said a deal’s unlikely given what he called the “irresolvable” differences between the Senate and House. But he's been wrong before. Senate Repubs. are prepping an alternative to Vets Affairs Chairman Bernie Sanders’s massive vets bill that repeals the $6 billion cut to military pensions as part of a larger package. The alternative is being led by Sen. Richard Burr (R-N.C) as Repubs. are balking at the way Sanders pays for his $24 billion measure. Nine Dem. 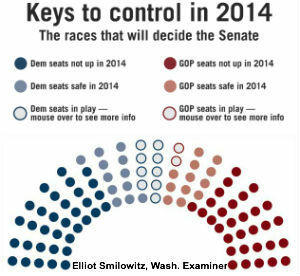 Senate seats are up for grabs in 2014 (MI, IA, NC, AK, MT, WV, SD, LA, AR), compared to only two Repub. seats (GA, KY). The Senate on Friday voted to advance a stopgap spending bill in a 79-19 vote (19 R's voted no; 25 voted yes). Dems will indubitably strip the Obamacare defunding language from the measure.